Fig season has come and gone—and come again. 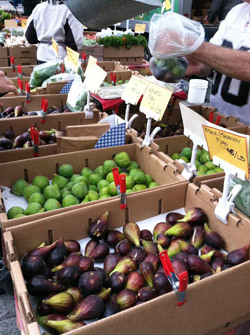 Fresh figs appear at the farmers market in early summer, but the trees have a strange cycle of seasonal production. A brief midsummer hiatus leaves many shoppers hanging and hungry for more of the sticky-sweet delicacy. The first harvest, known as the breba crop (la breva in Spanish), begins in June and lasts through the end of July, when the fruit disappears from the market for several weeks to return in mid-August. Why the gap? 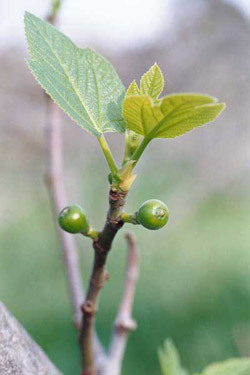 While breba figs grow on the previous year’s wood, the main crop gets its start a little later because it grows on new shoots that sprout after winter pruning. “The breba crop is a finite crop because there are fewer places for figs to happen on last year’s wood,” Knoll explains. The breba wave may be brief, but it is still a force to be reckoned with. One Saturday this June, the Knolls brought a ton of figs (literally) to market. The second harvest is longer and more prolific, usually running through October or so, depending on whether there’s an Indian summer. Some fig aficionados claim that the main crop is sweeter than the breba, but Knoll thinks both crops are as sweet as can be. The fabled fruit has a long history in the warm, dry climates of the Middle East and Mediterranean, where it is still enjoyed widely today. California accounts for the entire fig production of the United States, with most of it concentrated in the Central Valley, but since 95 percent of the fruit is dried or processed, fresh figs are a rare treat outside of summer farmers markets. Certified organic since 1984, Knoll Farm’s practices go above and beyond the standard certification requirements to incorporate permaculture and biodynamic techniques. And growing figs, particularly organic ones that are picked and sold ripe, is no cakewalk. First, there are pests, such as ants, birds, and squirrels, which all love the sweet crop as much as people do. Second, figs are not an easy crop to pick. As Knoll puts it, “Eating figs is a lot more fun than picking figs. It’s a hot, nasty job.” All orchard workers must wear gloves, handkerchiefs, and other protective gear. “If your skin gets in contact with the fig leaves, then later on, when you’re sweating, it makes you itch,” she explains. To add another level of challenge, the tree secretes a milky, mildly toxic sap known as “fig latex” when fruit are picked or leaves cut off. The substance is so caustic that it can be used to remove warts. Ripe figs must be packed and handled carefully to avoid any losses on the road to market. “They’re a difficult crop,” Knoll says. “That’s why a lot of big fig growers pick them way less ripe, which produces a different fig.” Shoppers who haven’t bought fresh figs before are often squeamish about picking the tender, plump ripe ones, so they gravitate toward firmer, less ripe fruit. But unripe figs do not ripen off the tree, and they are generally acrid-tasting. As any fig initiate will tell you, the proof is in a ripe fruit’s delicate flesh and sweet, gooey strawberry-colored center. Converting people to the pleasures of ripe figs has required a bit of education, Knoll notes. “We try to help people figure out where their palate is on figs,” she says. “Some people like them creamy soft, some people like them a little back from that.” She encourages people to taste different varieties at varying levels of ripeness to figure out where their tastes lie. The Knolls grow six varieties of fig: the classic Black Mission, the hefty, purplish Brown Turkey, the light green Adriatic and Kadota, the Melissa (resembling a small Brown Turkey), and the “Mystery Fig,” an unknown variety that sprouted up from seed near the farm’s drying racks. Look for Knoll Farms in the back plaza at the Saturday market. 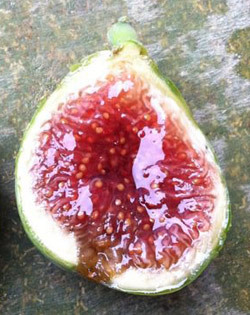 You can find a full list of our farms who grow figs here and recipes for cooking with figs here. Photos courtesy of Knolls Farms. This article was updated from a previously published version.